This month I’ve finally had time to get out and go on some “shakedown” hikes. I’d just call them backpacking trips, but evidently since I’m thru-hiking that’s what it’s called now. Go figure. Just after Christmas Isaac and I went on a quick overnight trip. 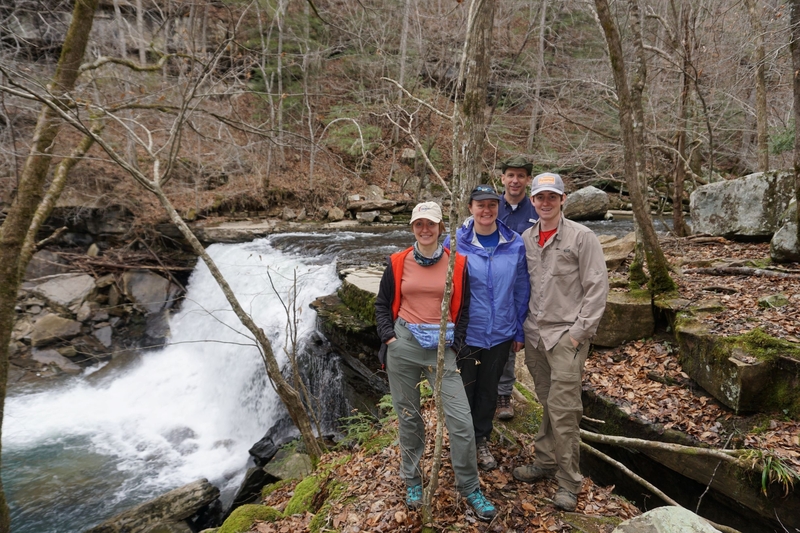 Savage Gulf is located on the Cumberland Plateau and is a lovely and unique destination. My first backpacking trip was at Savage Gulf with my dad almost ten years ago, so there’s some sentimental value added there too. We dropped our car at the terminus and then rode to the trailhead with my parents, who hiked with us for a few miles. The hike in was really awesome—perfect weather, cool waterfalls, even a few delightfully sketchy suspension bridges. Horsepound Falls with Mom, Dad, and Isaac. After the second waterfall my parents headed back to the trailhead and went home. Once my parents turned back Isaac and I hiked on for a few miles, then set up camp at Sawmill Campground. We had a pretty low-key night at first. After dinner we sat by a nice fire and drank some whiskey, then went to bed fairly early. After we went to bed, however, it got interesting. The wind picked up; then it really really picked up. All in all, we ended up moving our tent at 11 p.m. for fear of being squished. And my headlamp died. 10/10 would not recommend. One would think that after this the trip would mellow out, but that was not the case. While hiking out the wind continued to pick up and we watched dead trees and branches fall all day. I hiked five miles way quicker than I thought I could! Our shiny new Z-packs Triplex at Sawmill Campground. Fortunately, our trips this month have allowed Isaac and me to test new gear in various situations. 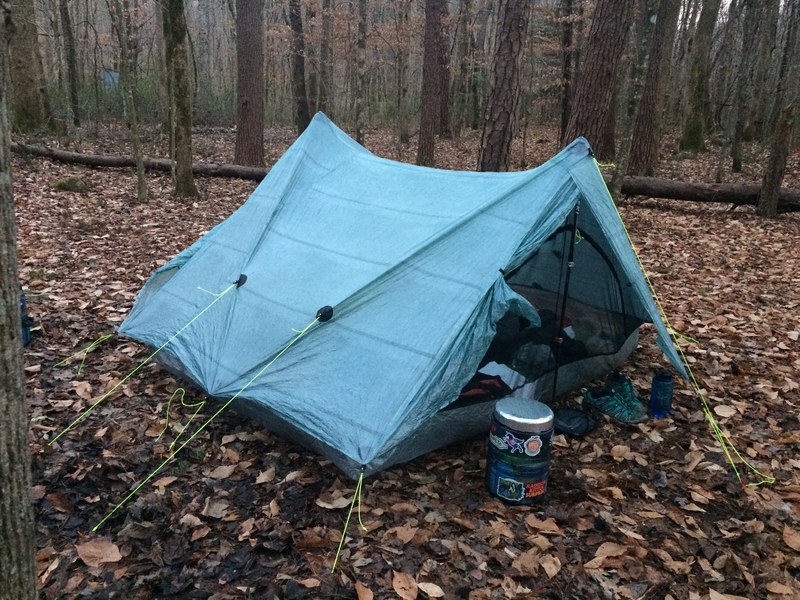 At the beginning of the month we did a 20-mile loop over two nights at Frozen Head State Park in Wartburg, TN. True to TN weather inconsistency, it was far colder at the beginning of December than it is now. It’s currently 66 and rainy where I am in Middle TN. Those nights at Frozen Head it got down to below freezing. I was excited to find out that even in cold and humid conditions, the condensation in our Triplex wasn’t any worse than in most double-walled tents. We’ve also been making adjustments to our packs. Isaac and I decided to buy ULA Epic packs this fall, and we’ve both completely fallen in love with them. They were originally designed for packrafting, and are essentially just 65-liter Sea-to-Summit dry bags built into a lightweight frame. The packs have storage areas under the drybags meant for holding a raft, but as you can see we’ve put our bear vaults there. It’s taken some ingenuity (mostly on Isaac’s part), but we’ve finally figured out how to make the BV stay put. Hopefully. Now that we’re at the last day of 2018, I am started to get pretty excited about the AT. It’s been amazing to get all of our gear ready for the trek and really see things come together. We’ve decided we’ll start the trail on March 24, so let the countdown begin! Obviously, my new year’s resolution is to hike 2,190 miles across the country. I can’t wait. The bear vaults are required I think on only one short section of the AT (Blood Mtn) and of course in the Smokies they have hanging devices or boxes. 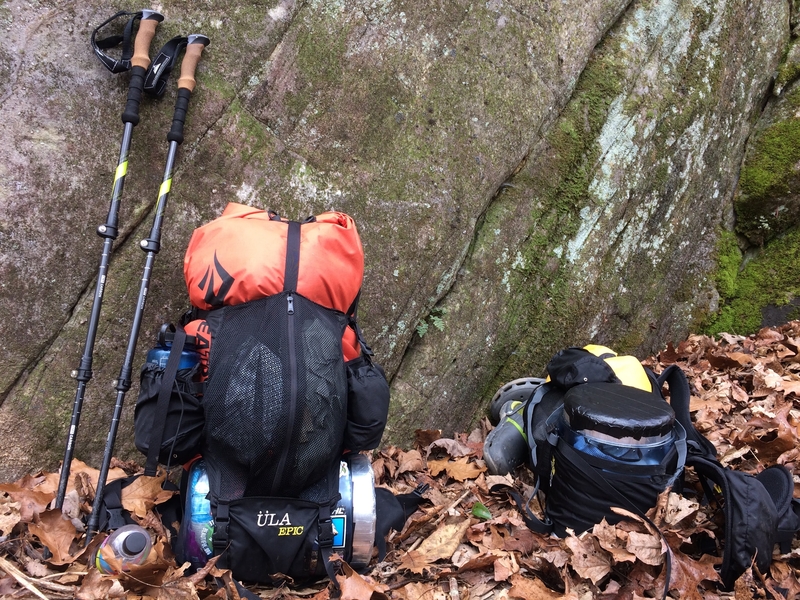 You might consider whether you want to rely on them all the way on the thru-hike. 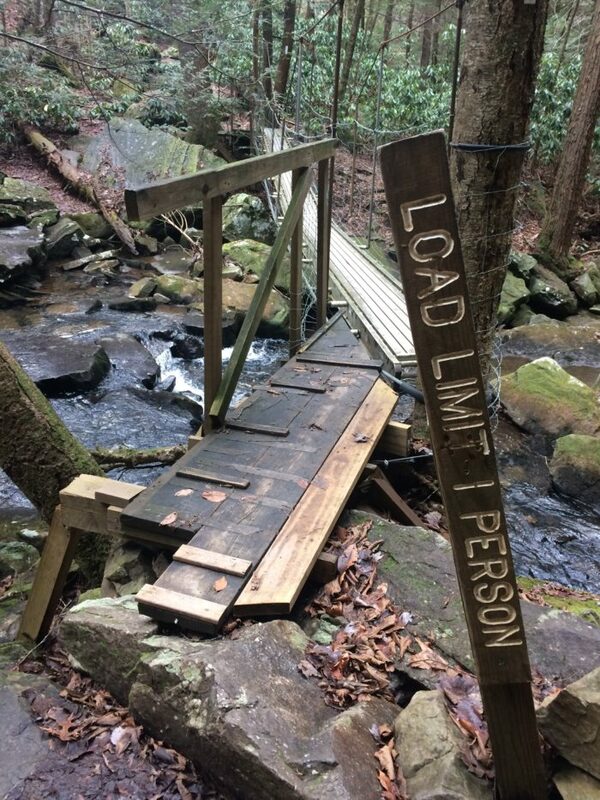 Maybe talk to some other thru-hikers. They’re heavy, bulky, and don’t hold enough food for more than a few days, but of course they do work when necessary. And most advice I think is not to put the heavy stuff (like a bear canister) at the bottom of your back. I personally use a Kevlar based Ursack for short and week long plus backpacks whenever possible and studies show they work, much lighter, more flexible, and they hold more. But in fairness mine has only been tested on a backpack (I’ve used one for at least 10 years including in Alaska) by a fox last year in Idaho’s Boulder-White Clouds Wilderness, he chewed on it a bit but wasn’t able to get in. Hey Will, I’ve been experimenting with the BV and I’m not sure whether of not I’ll carry it for my entire trip. I really like the convenience – not having to hang a bear bag is awesome! I actually purchased an Ursack myself, so I may switch to that at some point. I’ll keep ya updated. I absolutely love reading all the pieces on the Trek website, but the title of this one seems really inappropriate considering the heartbreaking event that just took place in Great Smoky Mountains NP. A woman died from a falling tree as she was attempting to push her son out of the way. No mention of this is made in this piece, so maybe the writer didn’t know about this incident. However, I think out of respect for that brave woman and her family, it seems a title like this was ill timed and shouldn’t be taken so lightly. Just wanted to apologize for my ill-timed title. I was unaware of this tragic event, but I have now changed the title. Hiker safety is not a joke and shouldn’t be taken lightly. Thank you for pointing out my oversight. I really enjoy The Trek and have recently started consuming Backpacker Radio in chunks. I also hope to be a correspondent from the trail one day myself. However, I’m curious as to the title of this article and it’s intent considering it’s content. Given we just had a mother crushed to death by a tree on Porter’s Creek Trail in GSMNP, a trail I recently hiked with my wife. The mother in question shoved her son out of the path of the falling tree and subsequently took the blow herself. I don’t know if the writer of this article is completely unaware of the incident or if the author has deliberately framed the title as clickbait for view counts. Given the timing and the unrelated content as compared to the title, I’m likely to believe the latter. If this is the case, the author should be ashamed at mocking a tragedy in attempts to get clicks. The Trek is better than this. Hi Gene, I’d like to apologize for my inappropriate title. I was unaware of this tragic event and named my article because of my own scary experience. The article is meant to tell a story about my recent experience with falling trees and branches in Monteagle, which I discuss in the fourth and fifth paragraph of the post. In reality I shouldn’t have made a joke about hiker safety in the first place. Thank you for pointing out my mistake.